Hello! Welcome to the first day of Taylored Expressions August Sneak Peeks! The Baker's Dozen is kicking off 4 days of projects (3 days of peeks and release day). After taking the month of July off, we are excited to show you some new TE products! We are releasing 12 new stamp sets and 16 new dies! All products will be released on Thursday, August 8, @ 7 AM PST. This month, we have Melyssa Connolly joining us as Guest Designer, and Jeanne Streiff is the newest member of the Baker's Dozen! Welcome Melyssa and Jeanne! I know you will love what they have created! 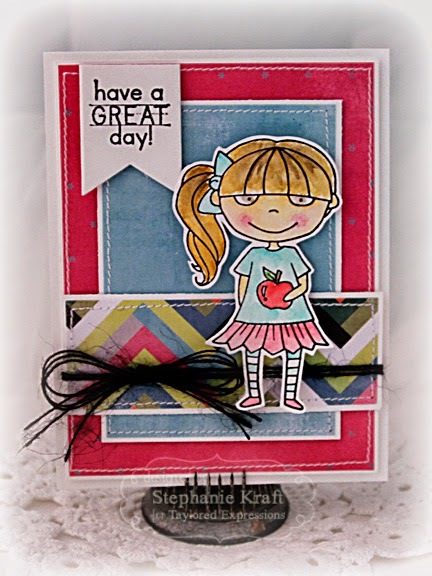 My first card uses Mischief Maker - Back to School, the newest MM illustrated by Danielle Lounds! 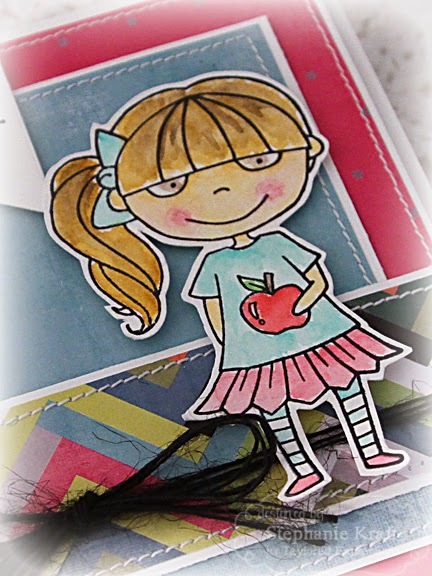 I stamped this cutie on Choice Watercolor paper and colored with Gansai Tambi water colors. I LOVE these paints! They are so creamy! My next card features one of the new Little Bits dies. This one is Little Bits - Crayon. I die cut the crayon in a rainbow of colors. The sentiment is from Mischief Maker - Back to School. Accessories: Taylored Dies: Banner Stacklets 1 (TE), Gansai Tambi watercolour (Kuretake), Black twine (May Arts), Foam tape, Thread, Sewing machine. Accessories: Taylored Dies: Little Bits – Crayon, Band It (TE); Foam tape, Thread, Sewing machine. I just love both of your cards, Stephanie!!! Your watercoloring is beautiful on that sweet little MM and I love the fun crayons on the second!!! I'm in awe of your perfect sewing, too...I need to take lessons...LOL!!! Darling cards Steph. Love the coloring on Mischief Maker... and oh, those crayons... fantastic colors. Super cute cards Stephanie! 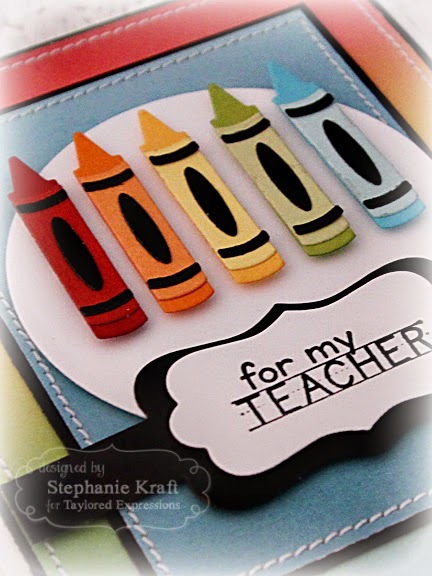 Great way to showcase the adorable image and I love all the colorful crayons! both cards are darling. My favorite is the crayon card. Love how you popped the crayons and sentiment band. The panel layers are wonderful! OH MY Goodness!! 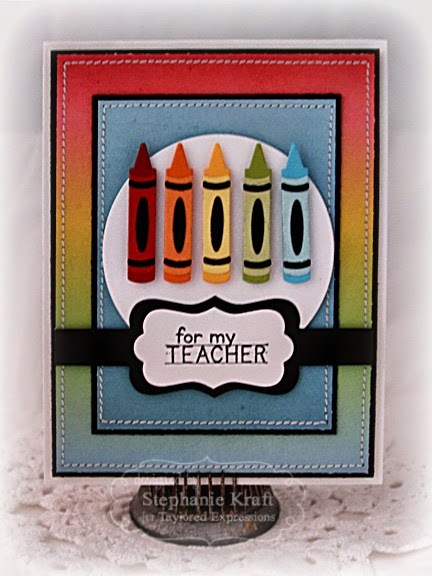 I love your card..the colors & layout are fabulous! And I love the same wonderul colors on your crayon card..so cute!! Love how you used watercolors for the little Mischief Maker! Such an awesome look.